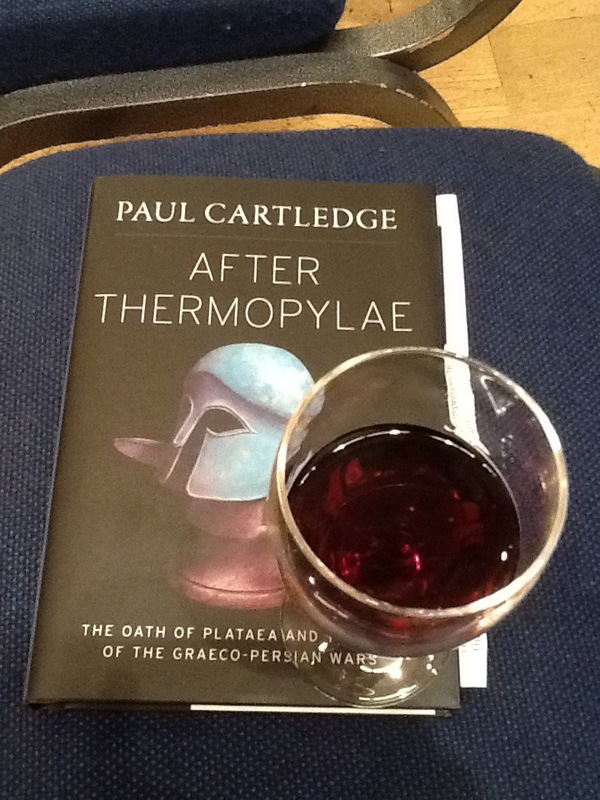 Paul Cartledge’s talk at the Hellenic Centre (on 12.11.13) in London, which I wrote about here. Unfortunately, it does not include the Q and A at the end. Last night I visited the Hellenic Centre in London for the first time to hear Professor Paul Cartledge speak on the subject of the oath of Plataea. The event was sponsored by the Hellenic Society, which hosted a talk on Alexander by Robin Lane Fox (and which I wrote about here) a few months ago. It is a real privilege and joy to be a member of the society and attend talks by these great scholars. I hope that one day I can follow them to Greece. By the bye, I don’t think you have to be a member of the Society to attend the talks – I wasn’t when I went to the RLF one – so if you see one that you are interested in get in touch with the Society to find out if you can go along. Cartledge’s talk was recorded so I imagine (as with Lane Fox’s) it will appear on-line soon. As and when it does, I shall post a link or ’embed’ the video on this blog. I didn’t take any notes last night, so instead of writing a report here are three things that made an impression on me, and which are still on my mind. When Xerxes crossed the Hellespont in 480 BC his passage was impeded by violent weather. It even destroyed the temporary bridge he had constructed to facilitate the crossing. Enraged, Xerxes ordered the sea to be whipped and branded, and for fetters to be thrown into it. To you and me today this sounds like absurd behaviour, comical even. In 480, though, Xerxes’ actions were deadly serious. The ancients regarded the seas – as well as many other parts of the natural world – as being gods. For them, Xerxes wasn’t impotently lashing the sea, but demonstrating his authority over a divinity. And even more than that, he was treating the god of the Hellespont like a slave – for branding was a punishment for misbehaviour by slaves. Talk about hubris. In light of the above, I no longer think Xerxes absurd but blasphemous. Indeed, his action really rather takes my breath away. People say that Alexander became a megalomaniac towards the end of his life but at least he loved the gods. This is as trivial as (α) is serious. During his talk, Cartledge referred to ‘Byzantion, later called Constantinople, which some today call Istanbul’. This happily called to mind Patrick Leigh Fermor’s preference for calling Istanbul Constantinople in A Time of Gifts, Between The Wood and the Water and The Broken Road! Speaking of Leigh Fermor, have you read this good news about his headstone? During the post talk Q and A a questioner asked Cartledge what he thought of the famous quotation that the Battle of Marathon was a more important event in English history than that of Hastings. Cartledge didn’t agree with that. In his view, history is not a linear sequence of events, there is no thread that connects us to the ancient Greeks and Romans. In his view, we appropriate history and take from it what interests us. I agree with him – to a point (I don’t mean this in the Lord Copper sense). Yes, we fashion history in our own image. This can be seen very clearly today with many historians’ emphasis on gender relations and how ‘ordinary’ people lived. However, isn’t western morality founded on the Jewish Law? And doesn’t our legal system originate – at least in part – from the Roman code of law? Unfortunately, I just don’t know enough to answer these questions. If the answer was ‘yes’ to either one, though, it would show that there is a point of connection between us and those who came before. As you can see below, Cartledge’s book is titled After Thermopylae. This, he said, was the publisher’s title. In 2006, Cartledge wrote a book about Thermopylae itself. It sold 20,000 copies. In hardback. Why? Because of a certain film titled 300, which came out in the same year… Next year, the sequel to 300 is released. It picks up what happened, as you might guess, after Thermopylae…! I applaud Paul Cartledge’s publishers for their Odyssean cunning! Following the talk, I bought a copy of Cartledge’s book, above, which he kindly signed for me. I mentioned Patrick Leigh Fermor to him and was treated to a short discourse about how the word ‘Istanbul’ has (or may have?) Greek origins. I was bucked by his friendliness and preparedness to share his knowledge. Having spoken to the man himself and got my book signed all that was left to do was swig my (unmixed) wine. This I did with aplomb and made my way home, a very happy man. NB (Is there a Greek version of Nota Bene?) As at the Lane Fox talk, I learnt how to pronounce one or two ancient Greek words.